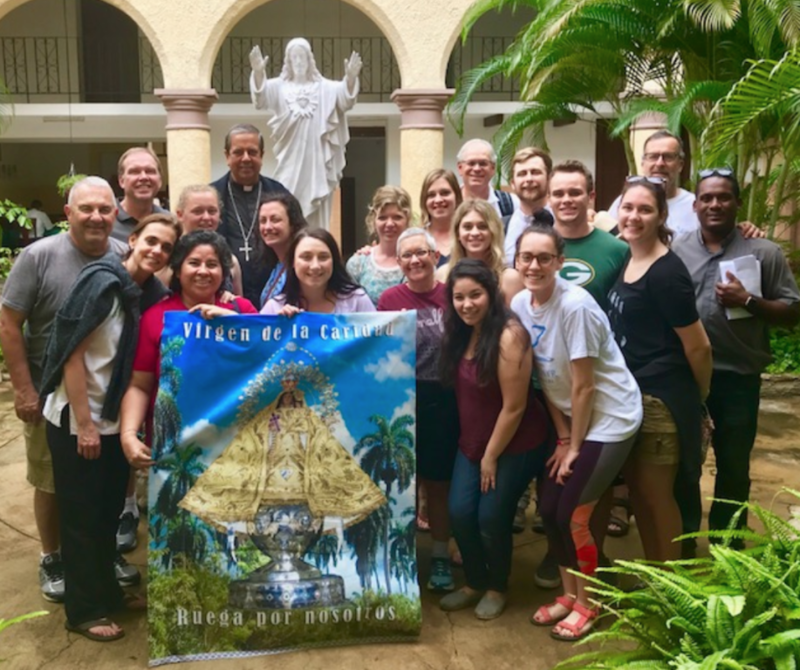 Our next trip to our Sister Parish in Cuba will be: July 15th - 23rd, 2019. Our 14 parishioners and Fr. Peter at our Sister Parish from January 4th - 11th, 2019. 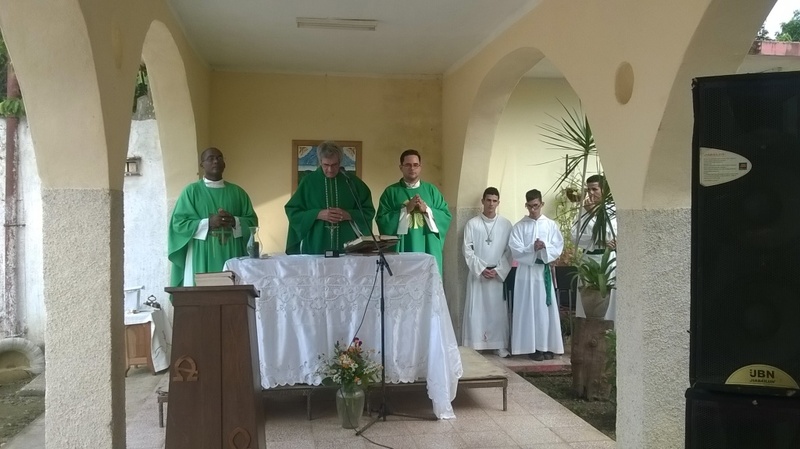 Our first trip to Cuba was in October, 2016 to our Sister Parish, San Miguel de Cubitas with Fr. Stan Mader. San Miguel de Cubitas is a very large parish in the area. There are many towns, at least 20, connected by roads described as poor to bad to nearly impassable. About 14 of these towns have some church building, usually in poor repair. Some were taken over by the government, and many simply have been empty or nearly so for 55 years. The largest, San Jose in Esmeralda, has not had a roof for over three years. Recently they received permission to purchase wood to rebuild the roof. 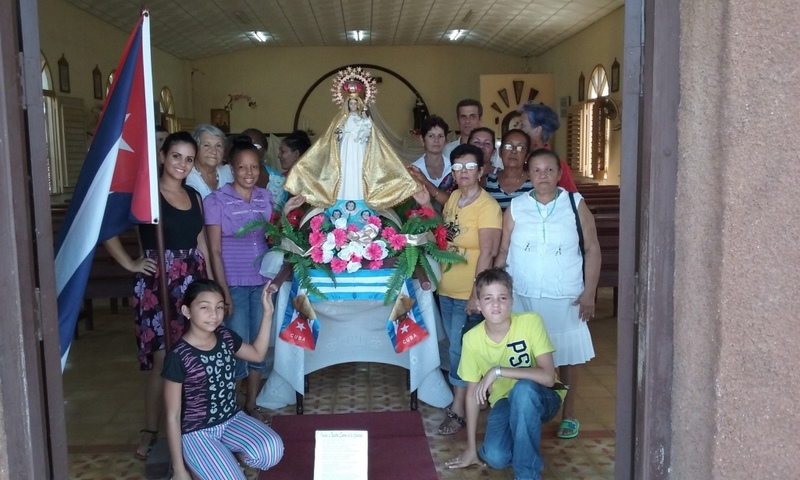 In eleven other towns they have established "La Casa de Misio'n, sort of home churches where people that gather together for prayer, singing and Word services. They typically meet in someone's yard, as the houses are too small to accommodate the dozen or so people who attend. All the town church groups are very small compared to places in the United States. Much of this is due to decades of repression of the Church in Cuba which has resulted in almost no knowledge of the faith, even fundamental belief in God. In 1960 there were, according to some reports, over 3,000 priests and nuns in Cuba. Within a few years the total was less than 500. For about 30 years repression was quite deep, and few people dared to attend Mass. Much of it was underground. A once dominantly Catholic country became a place where only 10% of the people were even baptized. Things began to thaw a bit in 1992, and a rebirth came with Pope John Paul II's visit in 1998. San Miguel de Cubita is a very small but very active community. I believe they can teach us many things. Among these are hospitality; how to create neighborhood faith groups; catechesis in homes among families and neighbors; post-marriage support for married couples; groups for people in their 20s. We will be praying for each other in various ways. At times we will send them a box of letters, music, pictures or other things that will help us understand each other well. We offer a Mass on the 8th of each month for our sister parish, and they will do the same day for us. As they have little news about the Church from the outside world, they are very grateful to learn that there is a rather vibrant Church in many countries that is backing them. Among projects beyond prayer, faith sharing and cultural exchanges, they hope we will have an interest in helping with education by aiding in building up their library, in pastoral matters, such as assisting them in their outreach to feed the poor there (it is extraordinary that those who can barely buy food for themselves do a meal outreach several times a month) spiritually through prayer and helping get people to their retreats and administratively in maintenance of buildings. It is an exciting relationship!